My boys will recognize this recipe as the one we always have on Halloween. You know… the time of year when everyone is ordering pizza because it’s so much easier to handle with all the trick-or-treating? I started making a recipe of my Auntie Jean’s Sloppy Joes (she calls it BBQ) when the boys were small because I wanted them to have a filling dinner before heading outside to beg for candy. I’m not a huge fan of Halloween (See my feelings on this “holiday” on my other blog) but since my boys loved it, this was my way to add some “normal” to the evening… add in some homemade rolls, and I was a happy camper. Note: I typically use one package of ground turkey instead of ground hamburger – I think it takes flavors even better than traditional beef. I also like to add a diced onion along with the meat, but this is purely up to you. When I make my version of Auntie Jean’s Sloppy Joes, I also add two turns around the pan of red wine to the ground meat to bump up the flavor a bit. For this recipe, I used a bottle of Pinot Noir that I had open in the fridge, but if I were opening something specifically for this dish, I’d reach for James River Cellars’ Rad Red or James River Cellars’ Meritage. Both have great cooking capability and are delicious all alone. I browned the diced onion, added the ground turkey until everything was nicely browned. Add the wine at this point and allow it to cook until the wine is incorporated into the mixture. Start adding your Sloppy Joe ingredients at this point. Remember that this recipe is written for DOUBLE the amount of ground meat, so you’ll need to have a light hand when adding ingredients. I always add much less ketchup than is called for, simply because you can always add more of an ingredient but you can’t remove it once it’s been incorporated. Allow the mixture to cook for a good half hour to really meld the flavors. I’ve found that really makes a difference with this recipe. NOTE: I served my Sloppy Joes on spaghetti squash (a la MomUncorked) and it was amazing! 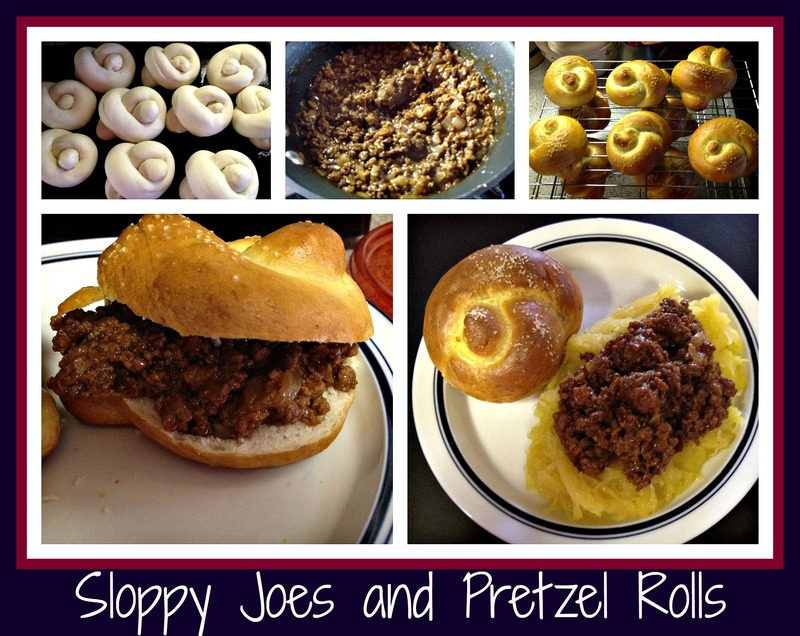 We have loved this Sloppy Joe recipe on all sorts of rolls, but here’s a BONUS RECIPE for you… Pretzel Rolls! I make my pretzel dough in my bread machine, according to the machine’s directions. I then divided it into 10 sections and formed thick pretzel shapes before allowing them to rise for about an hour in a warm, dry place. The key to making pretzel rolls is to boil the rolls (2-3 at a time) in 2 quarts of water plus 2 Tbs baking soda, flipping the roll and allowing to boil on both sides. I removed the rolls to baking sheets, sprayed with cooking spray and dusted with cornmeal (I used grits, since I was out of cornmeal). As the rolls came out of the water mixture, I brushed them with an egg wash and sprinkled them with coarse salt. Once all the rolls had been treated, I baked them in a preheated 400 degree oven for 10-13 minutes. Note: If you want to make this recipe into large soft pretzels instead of rolls, you can adjust the directions by making the pretzels thinner and then bake them just a little longer, until they’re even chewier. We did find that these rolls are a little chewy for sloppy joes… they’re more suited to burgers or grilled chicken… but they are just so darn delicious that I had to include this recipe for my readers. I hope you try this recipe sometime… they are TOTALLY worth the effort! This entry was posted in Cooking, Recipe, Wine and tagged ground turkey, James River Cellars Meritage, James River Cellars Rad Red, Pinot Noir, pretzel rolls, pretzels, Sloppy Joes.